It’s been a while since I’ve updated on the goings on of this blog and wanted to share a few updates and new things, before I totally forget. And for random, organization purposes, I decided to alphabetize it. I received this award from Heather at In This Storm a long while ago. Thank you so much, Heather! The rules of the “One Lovely Blog Award” are as follows: Accept your award and post it on your blog along with a link to the person who has sent it to you. Pass the award to 15 other blogs that you have newly discovered. You must contact the person to let them know that you have chosen them to receive the award. Not sure if you’ve noticed, but a few months ago I added a new section to the sidebar under “This month we remember…” where I’ve been listing babies who have a birthday, anniversary, or angel day for the month. I actually got the idea from Holly and Maggie. If I’m missing your baby this month, please let me know, so I can add his/her name. Also, I’m always honored to make a cupcake for your little one at Calvin’s Cupcakes. 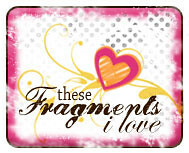 You may have noticed that I changed the name of my blog from Blessed to Be Broken to These Fragments, I Love. They both speak to being in pieces, but I decided that I didn’t want to keep Blessed to Be Broken for myself; that may not make a lot of sense right now, but I hope to share more soon (it has started with moving Calvin’s Cupcakes over to http://blessedtobebroken.com/calvinscupcakes). I decided on These Fragments, I Love, because although my heart is in pieces, although my family is broken without my babies here, I still love and am grateful for so much. For those of you who visit the site and aren’t so big on words and comments, I’ve added reaction buttons at the bottom of each post, so you can just click to share your thoughts—so please do! Angie began Still Life 365 as a space for creative expression by those who have been affected by pregnancy loss. I’ve been following the project for a while, but never submitted any work until April, when I participated in the community poem, XIII – Water and in the visual community poetry challenge. These were my lines: You were baptized in death, holy water sprinkled over your still body in my heavy arms // From the blessing on your tiny chest, ripples rose into waves–a tidal deluge of guilt and love and God. I also have two photos there I gave my child to God and I am a Mother. 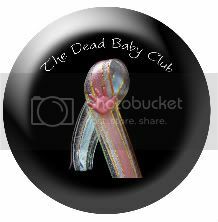 Not too long ago, I joined The Dead Baby Club as an author. Heather started the website as an interactive community for baby loss families in honor of her son, Logan. I worked on May’s feature, Unable to Conceive after Loss, and on the mid-month question, How was your Mother’s Day? A couple of months ago, I decided to join this year’s April A to Z Blogging Challenge. It’s now June, but I have yet to finish. It’s partly because I didn’t know about it until the end of March and joined on April 1st. The biggest reason I’m still working through it, I think, is because I chose my theme to be Unpacking Grief. I wanted to explore my grieving more and hopefully share some insights while providing a space where others can explore and share their own experiences. But it’s not always an easy place to enter, this grief. I’m so grateful for the responses I’ve received and to those who have stopped by to share their thoughts and feelings, to respond to the questions. I do have plans to make it all the way to Z; it might just take me a while. I’m glad you have something on your sidebar to remember babies. I know mommas appreciate it!